To make the blueberry jam, combine the blueberries, honey, rosewater and vanilla in a small saucepan. Set over low heat and gently simmer for 5–10 minutes, until the blueberries soften and begin to collapse to make a chunky jam. Set aside to cool. Meanwhile to prepare the chia pudding, heat the milk, honey and cardamom together in a small saucepan over low-medium heat for 3–4 minutes, or until it reaches scalding point. Set aside to infuse for 10 minutes. Strain the milk into a medium bowl, add the chia seeds and stir to combine. Set aside for 10­–15 minutes, stirring occasionally to break up any lumps, until the seeds absorb the liquid and swell to make a thick pudding consistency. Add the pistachios and stir to combine. To assemble, place a large spoonful of the jam into the base of two serving glasses or bowls. Cover with the chia pudding and spoon over the remaining jam. Top with a dollop of yoghurt and sprinkle with toasted flaked almonds and pistachios. Drizzle with honey for additional sweetness if desired. 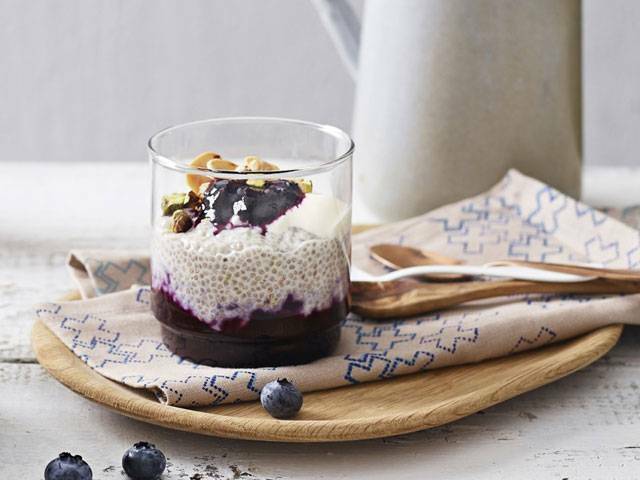 Thanks to the geographic spread of Australian blueberry farms, Aussies around the country can enjoy fresh, great tasting blueberries from July to April each year. With volume increasing and prices starting to drop, it's finally time to celebrate the start of the Australian blueberry season! Australian farmers produce some of the best quality blueberries in the world, grown to meet our country's high standards. We would love to help Australians incorporate this powerful little superfood into their weekly meals.